SageMD2 code is a user-friendly software package for research, engineering, and educational needs in atomic scale materials design. SageMD2 can be used in various operating systems, such as: Linux, FreeBSD, SGI IRIX, HP-UX, IBM AIX, SUN Solaris, DEC/Compaq Tru64 UNIX, and MS-Windows. SageMD2 main window is shown in Figure. 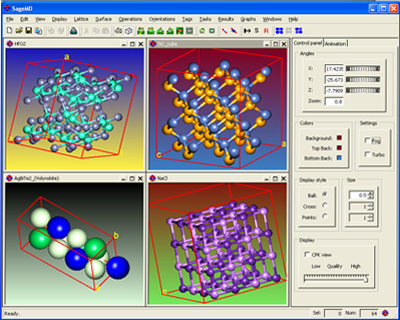 The SageMD2 code includes a graphic user interface (GUI) for solid state and molecular materials design at the atomic scale, a large set of computational modules for molecular dynamics, and databases of empirical force field potentials and crystal structures, as well as interfaces for various commercial quantum mechanical (QM) codes. 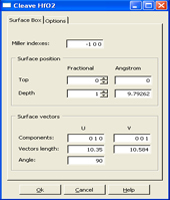 SageMD2 code can be used to model properties of materials at constant temperature and/or constant pressure, to study behavior of a crystal lattice under expansion or compression, to calculate Radial Distribution Functions (RDF) and Mean-Square Deviations (MSD) to derive atomic diffusion coefficients. The software allows using different boundary conditions namely: periodic boundary conditions, free surfaces, and movable walls. In addition, the charge equilibrium (QEq) approach for interatomic energy calculation which takes into account the atomic charge distribution has been incorporated into SageMD2 code for modeling the properties of materials with covalent chemical bonds. Copying RDF, MSD, temperature, energy, and stress graphs to MS Excel and MS Word. Nanotechnology: materials and process design, etc. Education: undergraduate and graduate curriculum, basic and materials science, engineering, physics and chemistry, molecular biology, etc. Research: process, materials and device design at the atomic scale. 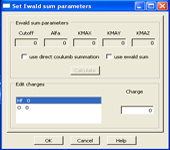 The SageMD2 graphic user interface has been developed using FOX library fox-toolkit. The computing modules are written in Fortran 90. The graphics is implemented with Open GL library which allows using the tools of advanced 3D graphic accelerators to quickly create and edit atomic structures. processing of the calculation results. 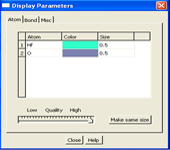 There is a suitable interface provided in SageMD2 for running the quantum chemistry codes for computations of interatomic and intermolecular force fields.